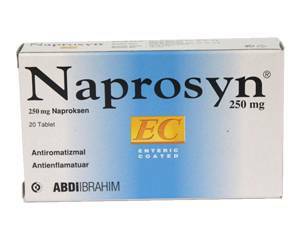 Naprosyn EC is a so-called NSAID: an anti-inflammatory painkiller. It contains the active ingredient naproxen. Naproxen slows down the production of prostaglandins, a hormone-like substance which acts as a mediator of pain, fever and inflammatory responses such as swelling and skin redness. Naprosyn EC can be used to treat conditions that involve pain and inflammation. Because of its anti-inflammatory effect, Naprosyn (naproxen) is often prescribed for rheumatic disorders and joint problems such as rheumatoid arthritis, arthrosis, Bechterew's disease, carpal tunnel syndrome, tennis elbow and bursitis. It is also commonly used to treat severe pain from menstrual cramps, headache, (dental) surgery and other sources. Naprosyn EC tablets are coated with a gastric acid resistant layer (EC stands for Enteric Coated) which ensures the active ingredient dissolves only in the intestine. This makes Naprosyn EC easy on the stomach. Swallow Naprosyn EC tablets whole with some liquid. Do not chew them as this will damage the enteric coating. Naprosyn EC should preferably be taken on an empty stomach, at least 30 minutes prior to eating. Two tablets, followed by one tablet every eight hours if necessary. Gastrointestinal symptoms such as nausea, stomach ache, vomiting and diarrhea. Headache, light-headedness, dizziness: these side effects generally disappear within a few days. Do not use Naprosyn EC if you are pregnant or planning to conceive, unless otherwise instructed by your doctor. With your doctor's approval, Naprosyn EC can be used while breastfeeding. Naprosyn EC may cause side effects such as dizziness. Stay out of traffic if you experience this side effect. Alcohol may intensify side effects such as stomach problems and dizziness. It is important that you are aware of this and reduce or stop alcohol consumption while taking this medicine.